Betsafe Poker is one of the gaming services offered at Betsafe.com, which also offers in-play betting, online sports betting, online casino, live casino, and virtual sports. The online poker room includes download, instant play, and mobile poker. It features generous poker bonuses, a poker school, poker tournaments, loyalty rewards, and poker tutorial videos. 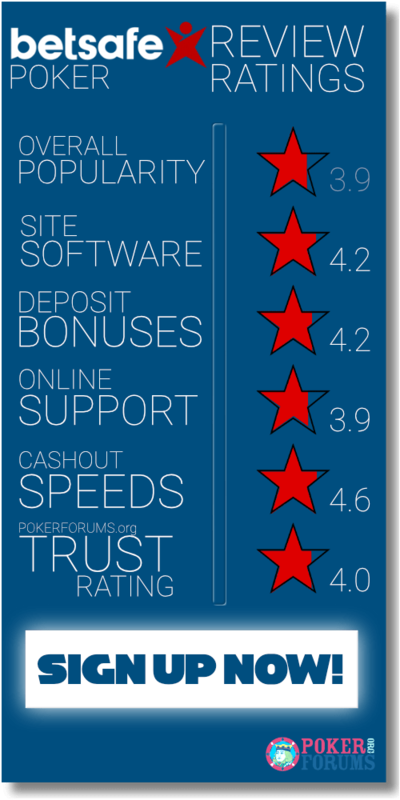 The following exhaustive, honest, and informative review of Betsafe Poker can help new players decide whether or not they would like to sign up for real money play. As previously mentioned, Betsafe Poker gives online poker players three options—Download Poker, Instant Play, and Mobile Poker. Download Poker – The download poker room supports Windows XP, Windows Vista, Windows 7, Windows 8, and Windows 10. To get started, players must click on the red Download Poker button on the homepage. When they do so, an online login form will appear on the screen, prompting them to create an account. Once they have created an account, they can download the online poker client and install it on their computers. Once the software has been successfully installed, players will see an icon on the desktop. Clicking on this icon will give them direct access to the online poker room and its bonus offers, promotions, and tournaments. However, players can access the online poker room only from one device—the computer on which they downloaded and installed the poker client. Instant Play – The instant play poker room is compatible with Mac and/or PC. This option is ideal for those who don’t want to download any software, owners of Mac devices, and those who do not own a computer. To start playing, players have to first create an account. They can then use their login details to log in to their accounts on any computer in the world. Mobile Poker – Betsafe Mobile Poker gives players the opportunity to play any online poker game at any time and from any location in the world. The mobile poker room offers all cash games, Fish Party SNGs, regular Sit and Go tournaments, and poker tournaments available at the desktop version. To play on the move, players don’t have to download any software or native poker gaming app. They just have to visit Betsafe.com on the browser of their smartphone or tablet and click on the Poker tab. They can then log in to their poker gaming accounts and play as many hands of poker as they wish. Betsafe Poker is an online poker brand belonging to Betsafe, which is among the leading providers of online gambling services in 100+ countries. Today, Betsafe serves a gaming community of more than 450,000 players. The online gambling site went live in January 2006 and quickly established itself as one of the most reliable and trustworthy companies in the industry. Players at Betsafe.com can access a variety of gambling products such as online casino, live casino, live betting, online sports betting, and poker with one account. Customer support is available round the clock through telephone, live chat, and email. So players will never feel alone or lost at the online poker room. Players can get in touch with Betsafe by sending an email to support-en@betsafe.com (general inquiries), payment-en@betsafe.com (account/bank inquiries), and marketing@betsafe.com (marketing/advertisement/PR). Betsafe is popular for its support of sport and the partnerships it has signed with Manchester City, a popular Premier League club; Cage Warriors, a leading mixed martial arts (MMA) league in Europe; Saracens, a rugby club in Europe; FC Koln, a popular football club in Germany; and Star Sixes, a football tournament for ex players. To register a real play account at Betsafe Poker, players must be at least 18 years old. The online poker room permits only individual players and not legal entities or companies to open real money accounts. Players should also check the gambling laws of their land and play only if it is legally permitted for them to do so. Afghanistan, Angola, Austria, Belgium, Cuba, Denmark, Estonia, France, Greece, Guyane, Hong Kong, Jordan, Iraq, Kuwait, Libya, Malaysia, Mauritania, Morocco, North Korea, Pakistan, Qatar, Saudi Arabia, Sudan, South Sudan, Syria, Tunisia, Yemen, USA, Algeria, Australia, Bahrain, China, Czech Republic, Eritrea, Ethiopia, Georgia, Guadeloupe, Hungary, Indonesia, Iran, Italy, Latvia, Lithuania, Martinique, Mauritius, Norfolk Island, Oman, Portugal, Rwanda, Slovenia, Somalia, Spain, Turkey and UAE. To open a new account Betsafe Poker, players have to reveal their full name, present address, valid email address, country of residence, date of birth, mobile number, and gender. They must choose the currency they would like to play in. The online poker room supports currencies such as Euro, US dollar, British pounds, Swedish kroner, Norwegian kroner, Polish Zlotys, and Bulgarian Lev. They also have to create and confirm their password. When they have completely filled in the online registration form, they have to click on the “Create Account” button. The online casino will then send them a welcome email, and players have to click on the link in the welcome email to verify their email address. They can now log in to their accounts and start playing cash games and tournaments. Players need to provide their correct information to the online poker room so that it can give them the best poker gaming service and maintain high security levels. Player data is safe as the online poker room uses sophisticated data protection measures. All data is well encrypted while being transferred online to the online poker room’s secure servers. €500 Bonus – Players must rake €250 to get loyalty points worth €50 as bonus. The bonus code is 500MGBLACK. €250 Bonus – Players must rake €125 to get loyalty points worth €25 as bonus. The bonus code is 250MGBLACK. €75 Bonus – Players must rake €25 to get loyalty points worth €5 as bonus. The bonus code is 75MGBLACK. €25 Bonus – Players must rake €5 to get loyalty points worth €1 as bonus. The bonus code is 25MGBLACK. All the bonus offers expire in 60 days and need to be released by that time frame. Create a new Betsafe Poker account. Download the poker client and select a poker alias. Click on the Available Bonuses tab at the top right corner of the website. Activate the welcome bonus of your choice by inputting the relevant bonus code. The bonus has to be activated within 30 days of creating a new player account. The chosen bonus should be raked in by playing real money tournaments or poker cash games. The online poker room releases percentages of your bonus amount into your account as soon as you reach the threshold. You can check your progress by visiting your account page and clicking on My Bonuses. While clearing their bonus, players can also earn loyalty points at the rate of 10 loyalty points for every €1 paid in tournament fees or rake. In addition, the online casino offers new players a free ticket to the €888 New Player Freeroll, which is played at 14:00 CET every Wednesday. The online poker room gives away only one welcome bonus to one player, one household, and one computer. Players can claim only one of the five welcome bonuses that the online poker room offers. Players have to activate the bonus of their choice manually by clicking on the “Available Bonuses” tab and inputting the relevant bonus code. Players should activate the bonus within 30 days of playing their first real money tournament or raked hand. Betsafe has the right to cancel or modify its welcome bonus without giving players any prior notice. New poker players can take part in new player tournaments over a period of four weeks. As soon as players create a new account, load it with funds, and get a poker alias, they will receive 28 tickets to the Level 1 tournaments. Now they should play a minimum of 10 hands of real money Texas Hold’em Poker to get 8 tickets to the Level 2 tournaments, which can be played over a period of four weeks. The New Player Level 1 freeroll tournaments have a prize pool of €50 and are played daily at 20:00 CET. Players can participate in these tournaments during the first four weeks after their first login. The New Player Level 2 freeroll tournaments have a prize pool of €500 and are played at 20:30 CET on Wednesdays and Fridays. Players can participate in these tournaments during the first four weeks after they unlock their achievement for Level 2. The New Player Level Up freeroll is played every Sunday at 20:00 CET. The prize pool is €1000 plus tickets worth €150 to the MPN Poker Tour qualifier. Players can participate in this tournament during the first four weeks after they unlock their achievement for Level Up. Betsafe Poker encourages players to gamble in a responsible manner, and offers the following gambling management tools. Self-assessment Test – Players can take a self-assessment test from GamCare to better understand their gambling habits. The link to this test is available on the support page of the online poker room. Cool-off Period – Available only for UK players, this tool allows players to take short breaks. To activate a cool-off period, players have to visit the self-exclusion section under responsible gambling and select one of the available options. If this confuses them, they can get in touch with a customer support agent. GamStop – Betsafe Poker is associated with GamStop, a free online service that is available only for UK players. GamStop helps players self-exclude from all online gambling sites operating under a UK license. Self-exclusion – If players want to exclude themselves from the online poker room, they have to visit their account page, click on “Your Details,” click on “Responsible Gaming,” and choose the “Self-exclusion” option. They can self-exclude for a day, a week, a month, or three or six months. The next step is to just click on the “Block Account” tab to complete the self-exclusion procedure. If players need urgent assistance, they can contact the online casino through live chat or call the online casino on the number +44-808-238-0028. Poker players can not only claim their share of a guaranteed prize pool of €1 million, but also win a portion of the leader board prize pool of €15,000 plus qualify for the MPN Poker Tour by taking part in the Universal Championship of Poker (UCOP). Here is an overview of the prizes players can win for achieving one of the top 20 spots on the UCOP leader board. The operator of the Microgaming Poker Network (MPN) Poker Tour is the MPN. The online poker rooms on the MPN are all powered by software developed by Microgaming, the biggest supplier of online gambling software in the world. The MPN Poker Tour was launched in May 2014 in London’s Aspers Casino. Later in September, another festival was held at Malta’s Portomaso Casino. The tour aims to be friendly, affordable, and fun. Since the tour goes to some of the greatest destinations in the world, participants can not only enjoy playing poker, but also experience the nightlife, party, and taste fine food. Since the tour is meant to be recreational, its events are designed for recreational poker players who are interested in socializing. Since the events have low buy-ins, more players can take part in them. Poker players can qualify for the MPN Poker Tour by creating an account at participating poker rooms such as 32Red Poker, Redbet, Betsson, Paf Poker, Guts, RedKings, OlyBet, NordicBet, RedBet, and BetSafe. These poker rooms run promotions and tournaments such as the UCOP, which give players opportunities to take part in the MPN Poker Tour. There is a difference between cash games and tournaments at Betsafe Poker. Cash games or ring games differ from poker tournaments in the way funds are introduced. Cash game players bring money to the table and use it to play the games. They can add more money later on, but never more than the max buy-in. If they lose all their money, they can reload. To enter the tournament, players have to pay fixed tournament fees which is usually referred to as a buy-in. Each participant will start out with a fixed number of chips that will be the same for all players. The winner is the player who finishes with the most number of chips at the end of the tournament. In case of tournaments, the blind levels are increased, forcing players to make decisions and narrowing down the player field as the game progresses. The chips players receive during a tournament have no monetary value. Sit and Go Tournaments – When players register for a Sit and Go tournament, the online poker room will deduct the entry fee and buy-in from their gaming accounts. If players leave the game before it begins, Betsafe Poker will refund the buy-in and entry fee to their accounts. If players leave the tournament after it begins, they will not get a refund. The online poker room will credit winnings, if any, directly to players’ accounts when the tournament comes to an end. Scheduled Tournaments – These are multi-table tournaments that require players to register well in advance. They have a specific start time and a maximum number of players who can take part. When the tournament begins, players will be assigned a seat at random. When players register for a scheduled tournament, the online poker room will deduct the entry fee and buy-in from their account. Players have to make sure they log in to their accounts before the tournament is scheduled to start. The poker client will automatically take them to their table when the tournament begins. Players are free to de-register before the tournament begins and get a refund. However, they will lose their entry fee and buy-in amount if they leave the tournament after the game has begun. The online poker room will credit winnings, if any, to players’ account when the tournament comes to an end. Fish Party Sit & Go – This is Microgaming’s innovative progressive jackpot tournament, which combines the best elements of poker and casino. Players have to visit the Fish Party lobby to select one of five buy-ins. The game requires a minimum of three players, and when those three players are seated at the table, Microgaming’s Fish Party slot loads on the screen and the poker client spins it for players. The outcome of that spin determines the prize pool of the tournament. In addition, the progressive jackpot keeps increasing in size with every game played. Players can win up to 5000x the tournament buy-in along with the progressive jackpot. Players can have only one poker alias, the name by which other players can know them. The poker alias should not be offensive. The poker alias cannot be changed. Betsafe does not permit coffee housing and chip dumping. While chatting with other players during a tournament, players can use only English or the permitted table language. Players cannot create partnerships of any kind during a tournament. The poker client blinds off players who sit out of a tournament. If a player slow plays repeatedly, the poker client will remove him/her from the table. Soft play is not permitted. Betsafe’s Microgaming-powered poker client offers tournaments, sit and go, and cash games based on popular poker variants such as Texas Hold’em, Omaha Hi-Low, Omaha, Razz, Seven Card Poker, Five Card Draw, and Five Card Stud. Betsafe Poker runs cash games continuously, so players will always find a cash game being played irrespective of their time of log in. Cash games are fun as they give players the chance to play with real money and quit whenever they please. Although cash games are social, fun, and exciting, players need a large bankroll to play them. As a result, poker experts advise newcomers to start playing Sit and Go tournaments as they are affordable and easier on the bankroll. If players prefer to play cash games, they can choose from betting structures such as Pot Limit, No Limit, and Limit and tables such as 6-Max, Heads-up, and 9-Max. Betsafe Poker is also the home of anonymous tables and Blaze Poker. Anonymous Tables – These are poker games that allow players to play without showing their poker aliases. Players can play anonymously without worrying about getting targeted by known opponents or tracking software. They give players a chance to freely and fearlessly practice and perfect their game. Blaze Poker – Blaze Poker is a high-speed poker cash game, in which players are pooled together and not assigned tables. As soon as they win or fold, they will get a new table with new opponents. Blaze Poker is so fast that it enables players to play hundreds of poker hands per hour. Betsafe has a Gold VIP Program that is simple, easy to participate in, and highly rewarding. Through this program, the online poker room rewards every single player with cashback. Players receive loyalty points for taking part in real money poker tournaments and ring games. Later, they can redeem these loyalty points for real money. The exact number of loyalty points that players can redeem for real money depends on the VIP level they have achieved. The poker client will upgrade players’ VIP level as soon as they earn the required points. Players can retain this level till the last day of the next calendar month. Every month, players can redeem a certain number of points for cash. They can use the rest of the points to buy-in to multi-table tournaments. However, the loyalty points will expire 180 days after earning them. So players must either redeem their points for cash or use them to buy in to tournaments before they expire. The online poker room maintains player deposits in tier-1 banks or financial institutions. Players can choose from the following banking methods to load their accounts or withdraw winnings, but some of these options may not be available in players’ country of residence. The time taken for your deposits to get credited to your account depends on the preferred banking method. Card deposits are instant, but bank transfer deposits may take up to five working days. Instant bank transfer deposits are instant; so are deposits made using Neteller and Skrill. Most of the methods used above can be used for deposits as well as withdrawals, but a few can be used only for withdrawals. For example, players can use MasterCard to load funds in their gaming account, but they cannot withdraw winnings back to their MasterCard. The minimum and maximum limit for withdrawals will be determined based on the banking method you select. The online poker room processes withdrawals in 24 hours after players place a payout request, but the time taken for the winnings to reflect in player accounts depends on the preferred withdrawal method. When the online poker room successfully processes payout requests, it will send an email confirming the same. If, for some reason, the payout request remains in processing state for over 24 hours, players have to contact a customer care representative to sort out the issue. Live Chat – If players open the live chat window, they may have to wait only 30 seconds before they are put in contact with a customer support agent. Email – If players email their doubts and questions to Betsafe Poker, they can expect a personalized response in just 30 – 60 minutes. Request Call Back – Players can request Betsafe Poker to call them back. The online poker room will call them back in 15 – 60 minutes. Players can also use the search bar at the top of the support page to find the required information. Betsafe Poker may request players to submit documents as part of a procedure called Know Your Customer (KYC) verification. Players have to upload these documents on their account page as the online poker room does not accept documents send through email. The KYC verification procedure at Betsafe Casino has two parts—address and identity. So players are required to submit a photographic identity proof, such as copies of driving license, passport, or government issued photo ID and a residential address proof such as copies of bank statements or latest utility bills. Players have to send scanned copies or photographs of their documents as the online poker room does not accept documents in black and white. They also have to ensure that the document clearly shows its date of expiry along with their photo, date of birth, residential address, and full name. The document also should not be older than six months. The documents should not be cropped as all their four corners should be easily visible. To prove that they indeed own their preferred banking method, players will also have to upload screenshots of their electronic wallet accounts, statements of bank accounts, and front/back of credit cards. In case of copies of credit cards, players should cover the CVC code and all the middle digits of their credit card number except the first six and last four digits. Copies of bank statements must reveal players’ bank account number and full name. Screenshots of electronic wallet accounts or online banking accounts must show players’ full names and the website URL. Players don’t have to worry about the safety of the documents they upload as the online casino stores them in secure and firewall-protected servers. The online casino always requests players to cover sensitive details on the documents they upload on their account page. The online poker room usually takes 24 hours to verify player documents, but in special cases, it may take more than 24 hours. If players fail to upload the required documents or upload fake documents, Betsafe is required by law to freeze, suspend, or restrict their accounts. Also, players cannot delete their personal information from their account pages as the online casino is required by the UK Gambling Commission and the Malta Gaming Authority (MGA) and various anti money laundering laws to preserve player details for a minimum of five years. If players do not access their Betsafe Poker accounts for 12 months, Betsafe considers their accounts to be inactive. If they do not access their accounts for 30 months, Betsafe considers their accounts to be dormant. If an inactive account holds real money, the online casino will charge a monthly administration fee of €5 till players either activate their accounts again or the funds get depleted. The online poker room closes dormant accounts and transfers remaining funds, if any, to the Malta Gaming Authority (MGA). If an account is on the verge of becoming inactive, the online poker room warns the account holder through email 30 days in advance. But this alert will be sent only if the account holds real money. Betsafe Poker also alerts players when the account turns inactive and it starts deducting the monthly administrative fee of €5. The online poker room will send the third alert when the account turns dormant. Q1: What happens if I get disconnected during a game? If players get disconnected when a hand is being played, they will be given 30 seconds to get reconnected. If they cannot get reconnected within 30 seconds, the poker client will automatically check if their hand qualifies. If the hand does not qualify but has all-ins, the poker client considers the hand to be all-in. If the hand cannot be considered all-in and does not qualify to be checked, the poker client will automatically fold it. The poker client blinds off players who are unable to return to the game. If the issue is with the game server, the poker client will cancel the hand and return player balance to its original state. Q2: What is 3D secure? A: MasterCard and Visa provides an extra layer of security called 3D Secure for online payments. When you input your card details while making a deposit, you will see a pop-up prompting you to enter your 3D security code. Your bank will then authenticate the transaction and confirm that you are indeed the card holder. However, you have to register with MasterCard SecureCode or Verified by Visa before you can use this feature. Q3: Can I use someone else’s credit card to make deposits into my gaming account? A: No. You can use a credit card that is issued in your name because the information you provide on your gaming account must match the information associated with the payment method you want to use. Q4: What is “Battle of Malta”? A: Battle of Malta refers to a NL Hold’em tournament played at Malta’s Portomaso Casino. The first battle was held in Nov 2012. The event has been designed for low-stakes and mid-stakes poker players. In 2017, its prize pool became as large as €1 millions. Betsafe Poker is among the sponsors of this event and gives its players the opportunity to qualify for the event. Q5: Can I permanently close my Betsafe Poker account? A: Players can close their gaming account permanently by contacting a customer care representative through request call back, live chat, or email. If players just need a break, they can use a gambling management tool called Time Out, which can be accessed on their account page. Time-outs at Betsafe Poker range from 24 hours to six months.